Granny Besse was my great-grandmother on my mother's side. Primarily remembered for her divine fried apple pies, she was a wonderful cook. I have a number of her recipes, some of which I have posted before on my blog. Her stuffed peppers is a favorite of mine. One thing I like about it is that it is so easy to pull together - you don't have to sauté or brown anything prior to baking. Recently Kroger had any color of pepper for 99 cents each, so I made stuffed peppers out of the orange variety, which I adore for their sweet flavor. Preheat oven to 350*. Cut the tops off the peppers and remove the seeds. Place in baking dish. Mix all the other ingredients by hand in a large bowl, then stuff the peppers. Bake for 45 minutes. This makes a lot, so sometimes I just stuff 5 peppers and make a mini meatloaf with the remaining meat mixture, which the boys can have for an easy dinner on one of the nights I'm working. 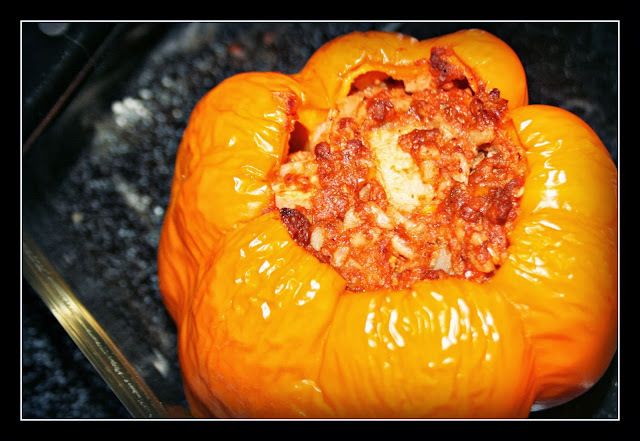 This recipe is a wonderful way to introduce your kids to peppers - mine love it! And on a side note - a happy 39th birthday to my husband, Paul. Wishing him a most excellent day today! That is the right way to make them, I cheated this year and used spanish rice mix. I hope Paul has a wonderful birthday. These look wonderful. They will be perfect to serve this fall. I've really come to enjoy stuffed peppers within the last few years. Looks yummy, Lisa! this is almost the same recipe that my gradnmother handed down ;-). (nothing here like sharp cheddar cheese and must wait for it to come from the western side of Canada and these stuffed peppers are just not the same without it)...funny the things one misses from home. I love your photo. Look so delicious! My family love pepper very much. Thank you for sharing. I haven't made these before. I might have to try this. A lovely dish to try. Stuffed Peppers is on the menu this week. I have never tried them but have always wanted to. Looks delicious! I think I would like the orange or red peppers better than the green. Just a perfect recipe for me today... I have a GIANT PEPPER to use!!!! My grandmother used to make stuffed bell peppers too. It was one of my favorites of hers. She did not leave a recipe for us, so thank you for sharing yours! Hope he has a wonderful birthday!! Happy Birthday to Paul. I have not made stuffed peppers in a long while. I have a few left in my garden I should go pick and stuff. I will try your recipe it sounds great. All my grandchildren eat fresh peppers as a snack. We slice them in strips and they eat them like candy. I haven't had stuffed peppers in forever. Yours look good! Happy birthday to Paul! John will love this recipe. My mom used to make this. She hasn't for a long time. It sounds, and looks good! Looks good! I haven't fixed stuffed peppers in years. I have a thing for bell peppers. :) This looks delish and I'll try it soon. Thanks! Happy belated birthday to your husband! He and my guy share a birthday!